So, you like the idea of ice and snow, wildlife and mindblowing landscapes but have no idea whether Antarctica or the Arctic is the better option for you – read on! – As they’re the two most common options in each case please assume when I talk about the Arctic I mean the Svalbard Archipelago and Antarctica is the peninsula region. The Arctic is water and ice surrounded by continents and Antarctica is a continent surrounded by water and ice. In my option you can’t go wrong with either – there’s no bad choice here. Ice can also become an addiction so you often will find people end up going to the other anyway for the complete set! The Arctic is more easily accessible, has magnificent mountain scenery with glaciers galore, huge bird colonies and the potential for polar bears around every curve of a fjord. You can get to much higher latitudes than down south so you can stand on the deck of a ship above 80degrees in the midnight sun with nothing but sea ice in pale pastel light between you and the pole while birds wheel above you. 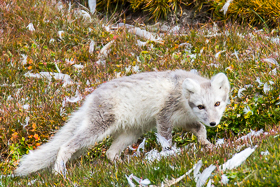 You can sit at the foot of bird cliffs watching arctic foxes hunt, surrounded by perfect tiny flowers. Everywhere you go on shore will be accompanied by armed guards against bear attacks so generally speaking your movements are constrained within a perimeter. 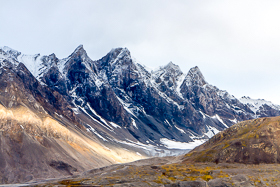 Both poles have mountains and glaciers galore and if you’re a landscape photographer both are amazing destinations. The north has sea ice and glacier faces to walk on and zodiac cruise, while the south has icebergs bigger than you can comprehend in shapes that seem impossible. Antarctica generally is much whiter than Svalbard, where the land is green for most of the summer. Honestly, I don’t think I could pick between them on this front. The Arctic can suffer from fog which can trap you on the ship – if you can’t see the bears approaching you can’t get off the boat. 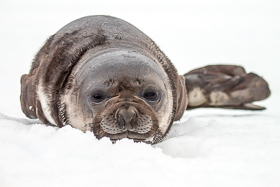 The Antarctic can suffer from hurricane force winds making it impossible to lower zodiacs. Both can have glorious (relatively) warm sunny days where the ice seems to glow from within or both can have weeks where conditions are impossible for any landings. There’s no month that’s particularly better or worse within the season, adverse weather is as likely at the beginning, middle or end. Let’s get this settled straight off – Polar bears are in the north in the Arctic. 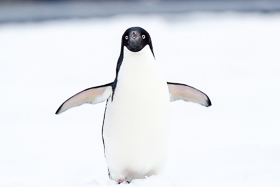 Penguins are in the south and Antarctic. If you want to see both, you’ll need to find a zoo! Now that’s sorted what can you expect in each place? The Artic has the big attraction that is polar bears, and the safari, permanent lookout and constant vigilance for the holy grail of bears on ice up close gives a certain atmosphere and expectation to any trip. The roaming and huge ranges of bears means there are no guarantees of a sighting. 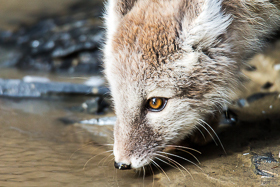 You also get the highly appealing cute factor of Arctic foxes. Almost any cliff you find will be populated with breeding gulls, fulmars, puffins, guillemots and auks in numbers beyond comprehension. The Arctic is the feeding ground of the big whales – Blues and Fins with Right and Beluga whales dotted around too and watch bearded, ringed and harp seals pop heads briefly above the ice floes. Walrus gather in huge blubbery groups on the she shorelines and reindeer will wander across the tundra. The number of different species of wildlife is more varied than down south. 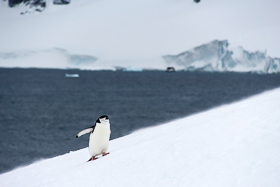 The Antarctic has penguins, penguins and then more penguins, and almost always easy to find and access. 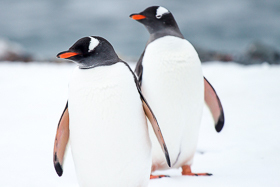 You can sit amongst colonies of tens of thousands of Gentoo, Chinstrap and Adelies. You can watch in awe the perfect engineering that is an Albatross in flight and the power of the Giant Petrels. 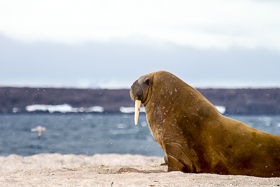 For large mammals you get the giant (if not elegant) elephant seal, with Weddell, crabeater and fur seals lounging on beaches. Your ship can be surrounded by pods of Orca, Humpback, and minke whales. It’s worth nothing that unless you’re on a very specialised trip you’re not going to see emperor penguins. The sheer numbers of animals are greater than the north. Both places are steeped in History with perhaps Antarctica pipping the Arctic to the post in terms of drama. Antarctica is the land of Amundsen, Scott, Shackleleton, Nordenskjold. The Arctic was visited by some of the above too, but add in the Pomor hunters, Nansen, Nobile, Rasmussen, Peary and of course the indigenous populations. There’s visible history in both places, from huts to remnants of the whaling and sealing industries laid out on shore. Antarctica has more active evidence of populations with scientific bases dotted around the peninsula more frequently than the Arctic however the town of Longyearbyen and Ny Alesund are permanent public settlements and excellent places to learn about the mining history, current life in an inhospitable climate, as well as having a very good museum giving the history of settlement. Generally speaking, the Arctic is easier to get to as once you get off a plane you’re there and don’t have the barrier of the Drake Passage. If you’re going to Svalbard you just need to get a flight to Oslo and then up to Longyearbyen, from London this takes about 6 hours of flying time (not including connection times). If you’re going to Greenland then it’s similar, fly to Reykjavik or Copenhagen and then across to Greenland, about 6 hours flight time from London. From North America you can get to Greenland from Ottawa, Vancouver or St John’s. For the Canadian Arctic (Nunavut) you can access from most major continental Canadian airports. Antarctica is invariably longer unless you’re already in South America. The typical route involves getting to Buenos Aires (15hrs from London) and from there to Ushuaia (4hrs from Buenos Aires), before sailing south to the continent (two days). If you have limited time and you’re based in the Northern Hemisphere then you can be at the ice of the arctic in a much shorter time frame. If you get the tightest connections you can (not necessarily recommended! ), from leaving London to seeing your first glacier/iceberg is about 10 hrs to the Arctic, and at least 72hrs for the Antarctic. I love both poles, and would happily visit either, but the decision often comes down to time and money. For someone in the Northern hemisphere, the Arctic can be reached more quickly and more cheaply with less holiday days required for an excellent experience. If time isn’t a concern and budget is less of a worry then Antarctica offers an a fantastic off the beaten track experience that has little to match it. In terms of wildlife encounters you can be close to birds and seals in Antarctica but see more variety in the Arctic albeit usually from a greater distance. If you’re prone to seasickness then the Arctic is great as waters are usually calm and there are no sea days without landings in the schedule. Pick the one that suits your timeframes and save the other for another year.